Are you a pool shark? Is your game room or billiard parlor missing something? 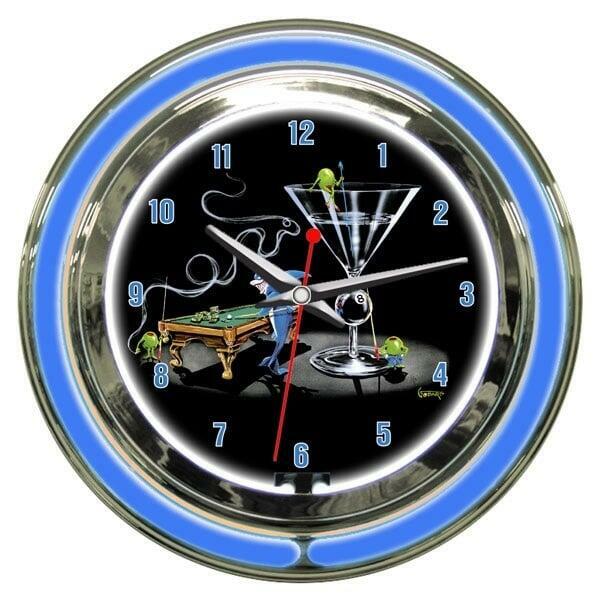 The Pool Shark II Wall Clock is the finishing touch for any man cave with a billiard table or bar, featuring awesome artwork from Michael Godard Designs. White background neon illuminates a familiar scene from Godard, with his famous martini olives playing pool and getting hustled by a grinning pool shark, all surrounded by a solid or blinking blue neon light (the pull chain offers you the ability to switch between the two).